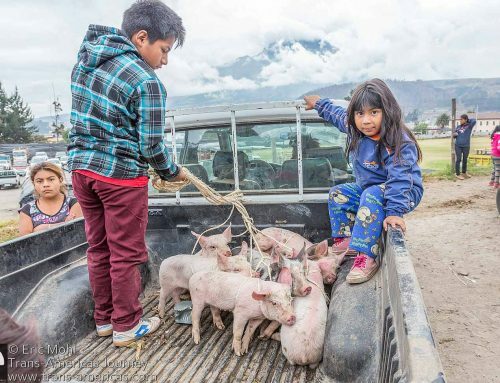 In Cajas National Park, high altitude grasslands spool out like waves of velvet around creeks and ponds as llamas wander through a landscape that was considered sacred ground by the Cañari people. 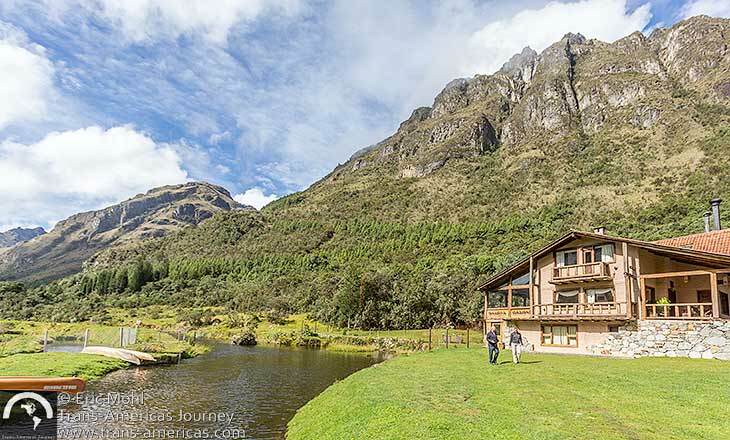 After hiking in Cajas National Park you may feel the same way. A moody moment in Cajas National park in Ecuador. 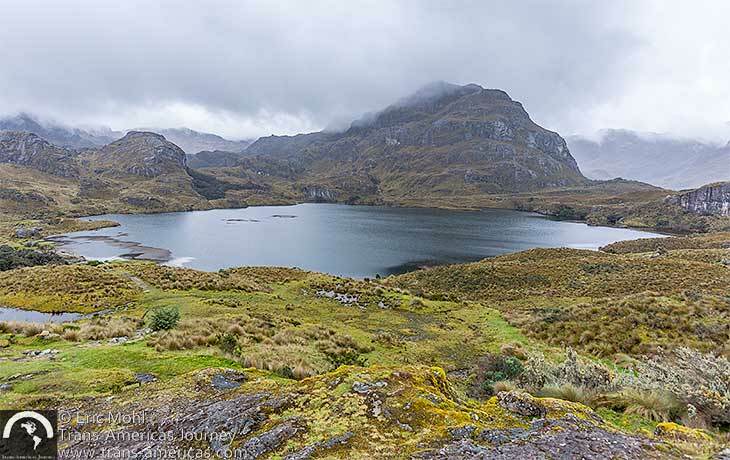 Cajas National Park (free admission), just 20 miles (30 km) from Cuenca, was founded in 1996 and exists at altitudes between 10,100 feet (3,100 meters) and 14,600 feet (4,450 meters). 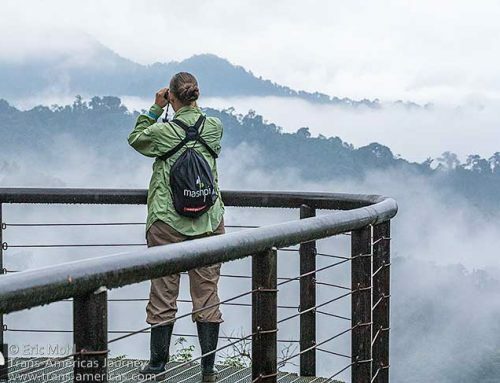 The park covers 7,000 acres (2,800 hectares) which are dotted with hundreds of lakes of varying sizes and is part of a larger UNESCO Biosphere Reserve which was declared in 2013. 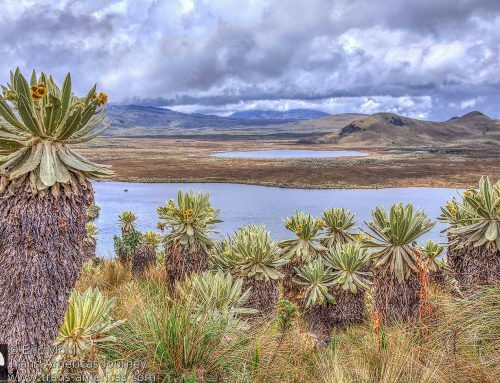 That blonde grass is one of the few plants that can survive in the windy, cold, high-altitude conditions in Cajas National Park. 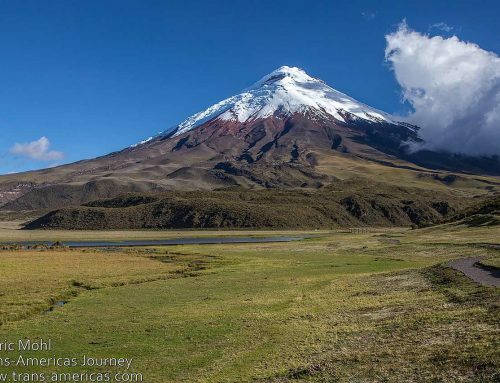 There are a variety of trails within Cajas National Park ranging from quick walks to multi-day hikes. 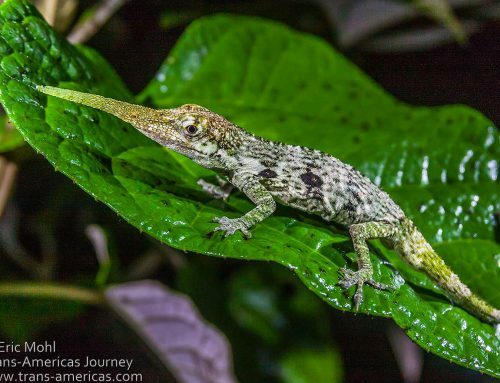 If you’re going anywhere off the beaten path take a guide. 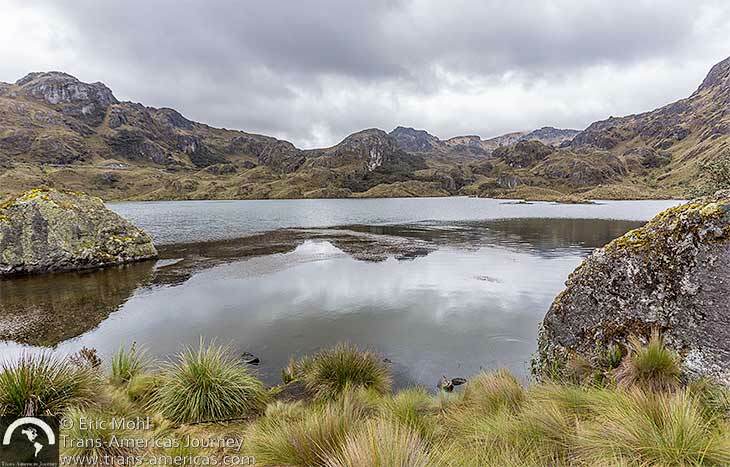 It is notoriously easy to get lost in Cajas National Park. Detailed maps, GPS coordinates and trail descriptions are available here. 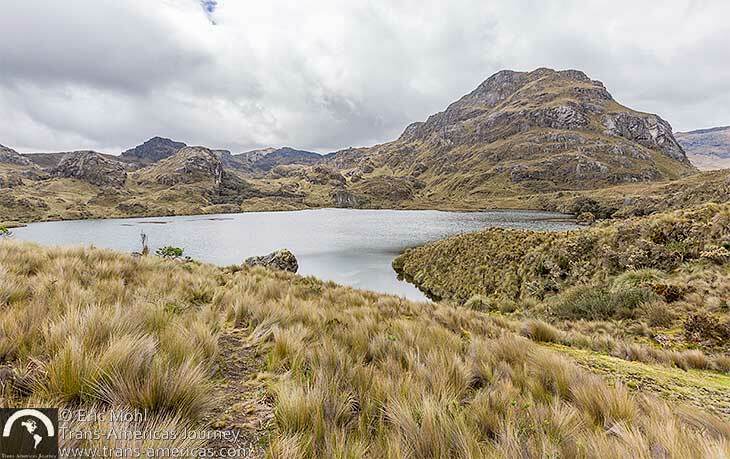 In Cajas National Park, water is king. 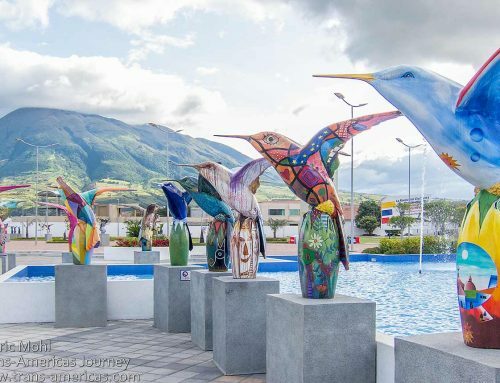 We hiked the popular (and clearly marked) Torreadas Trail which heads out from the park’s visitor center, which has bathrooms and a basic cafeteria, and around Lake Torreadas. The trail meanders past brooks, smaller bodies of water, over wooden bridges and through clusters of gnarled and stunted polylepis trees. Allow at least 1.5 hours an wears layers. The weather changed a lot during our hike. The climate is driest between August and January, but it can be cold and wet at any time. 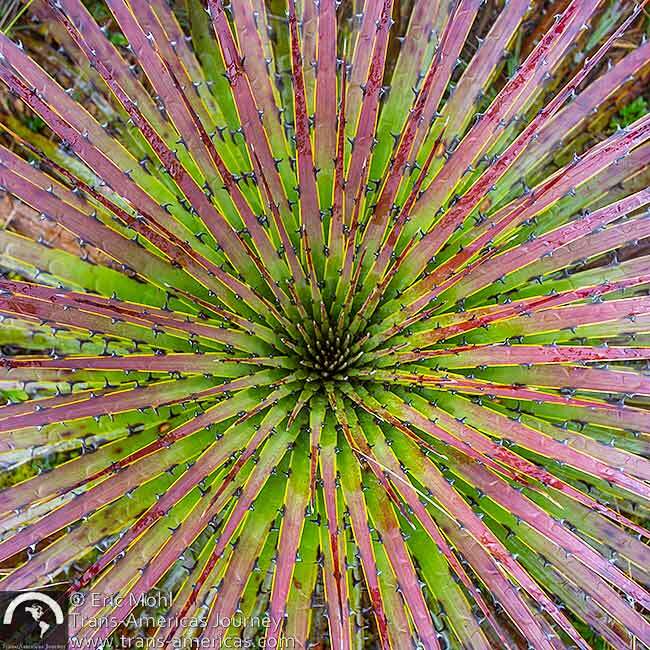 A hardy puya bromeliad in Cajas National Park. 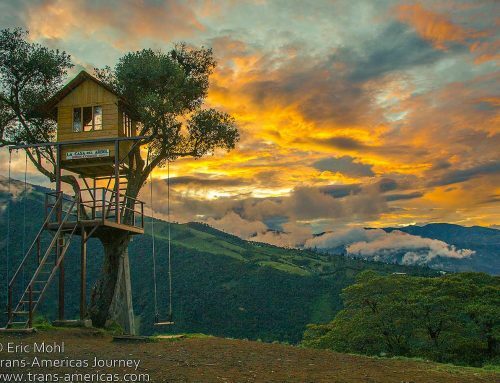 Most people visit the park on a day trip from Cuenca, but if you want to have a longer stay you can camp in some areas (be prepared for cold and wet) and there are a few basic shared refugios (like cabins) in the park too. 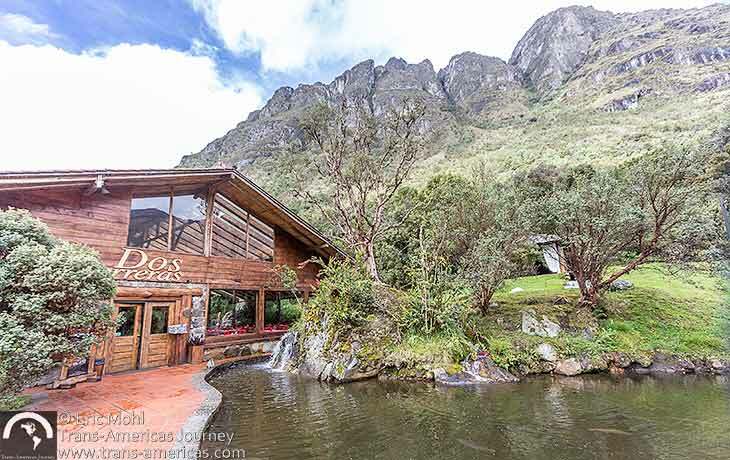 Dos Chorreras Hosteria near Cajas National Park. 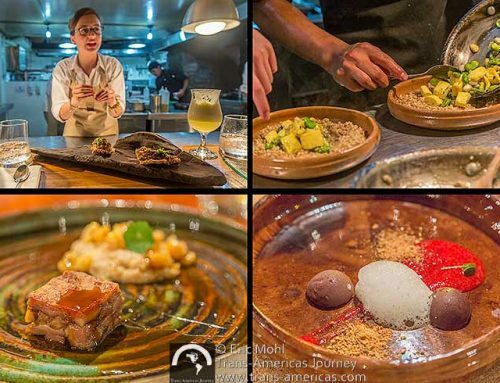 If you don’t want to rough it, consider Dos Chorreras Hosteria. Everything is oversized at this place which channels a Montana lodge by way of the Andes and is located just a few miles from the park entrance. The restaurant seats up to 200. The shop in the enormous lobby sells everything from rubber boots to artisanal cheese, lending a Latin Cracker Barrel look and feel. 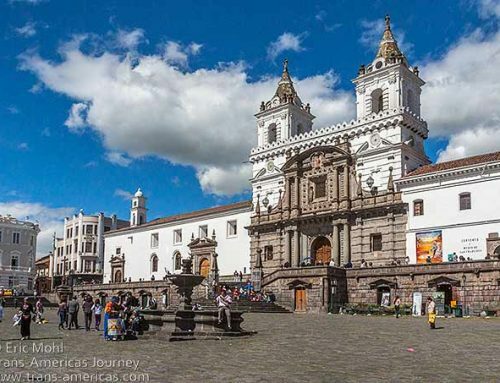 The dramatic setting of Dos Chorreras Hosteria. The rooms are larger than life too. We are in room #13 which has a huge fireplace (there are 14 fireplaces in the hotel) and a jetted tub for two. 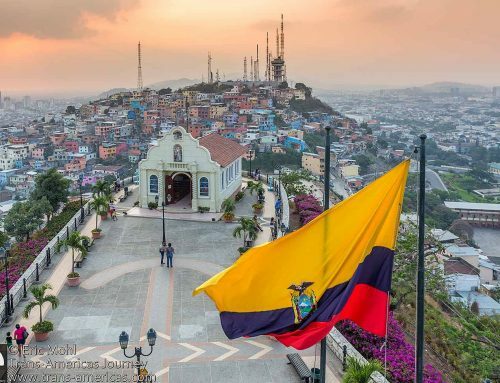 There are also duplex rooms, family rooms, and a stand alone cabin in which former Ecuadorian President Rafael Correa once slept. 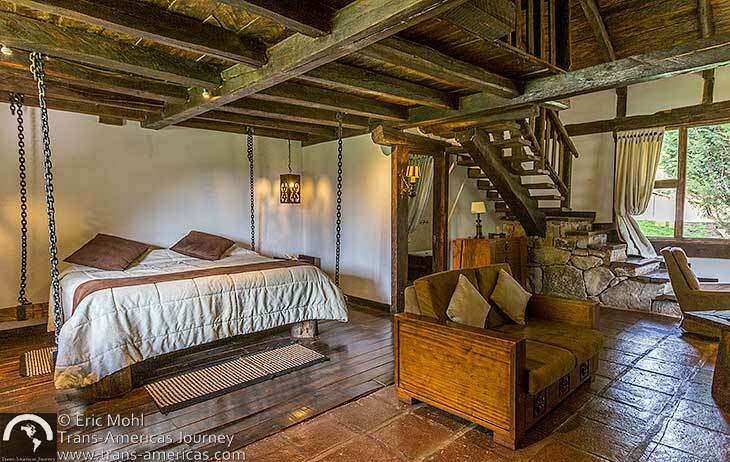 Dos Chorreras Hosteria offers a wide range of rooms, including one cabin where former President Rafael Correa once slept. 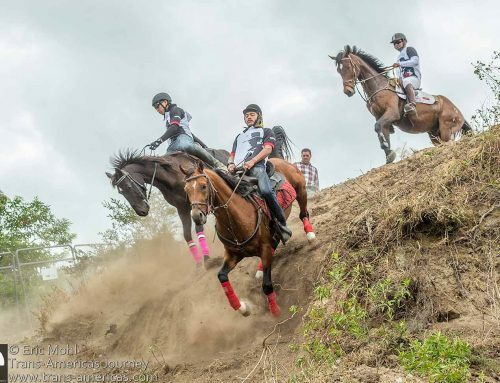 Horse back riding on the 9,800 acre (4,000 hectare) property is offered and you can take a guided tour of Pueblito Guavidula, a reconstruction of a small village that was built above the hotel in the 1800s along what as the only road through the area. A home, a shop. and the gold mine have been restored and can be toured with a guide. It’s like touring a ghost town in the United States, but much, much older. Part of Pueblito Guavidula, a restored ancient village above Dos Chorreras Hosteria. There are also many trout ponds on the property and we’re told that a member of the Carrasco family, that’s owned the property since the ’80s, was the first in the area to farm trout on a commercial scale — something that’s common now. 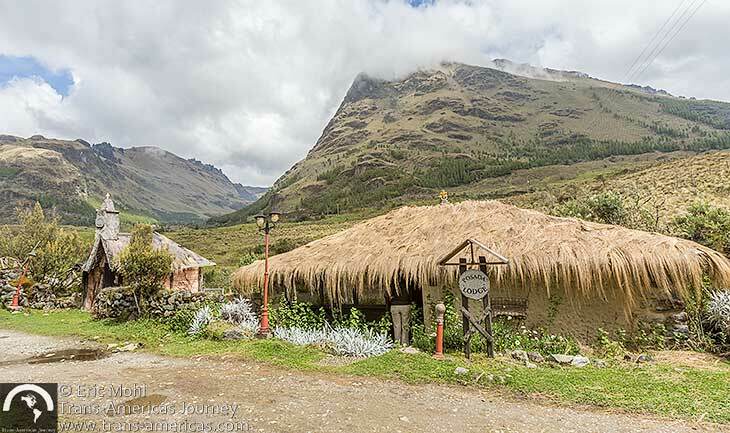 Even if you’re not staying at Dos Chorreras it’s a good place to stop for a hot beverage and a few of their famous cheese-filled fried empanadas. 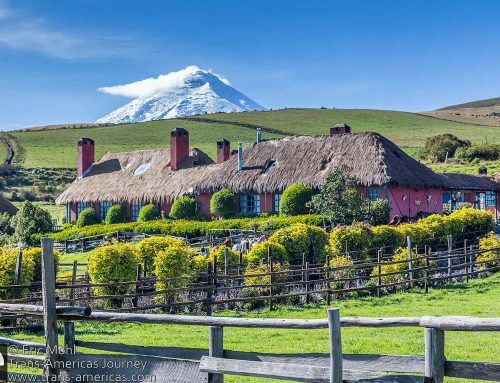 Dos Chorreras Hosteria looks amazing, I’d love to stay there and go horseback riding, which we’ve done in other places. 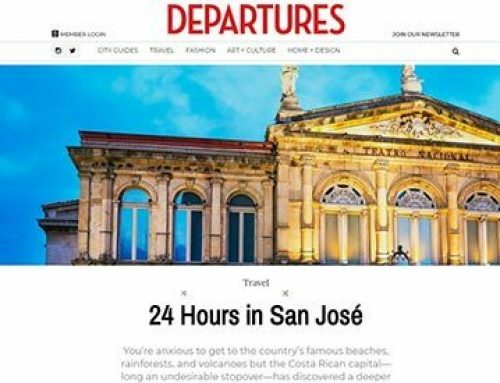 It’s a great way to see a place. 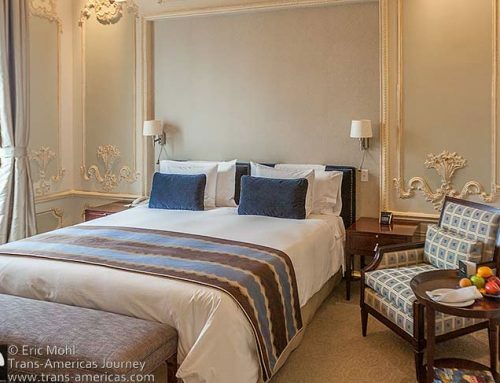 Looking at the picture of the hotel room I can’t help but wonder, what’s the deal with the chains in all four corners of the bed? It does look like itäs standing very firmly on log-like legs, so why chains as well? Just for the rough look? Nevertheless, imagine going on a horse riding tour, coming back for a soak in the tub and then dinner and resting in front of the fire place with some nice wine. Sounds fine by me! Hi Katrin, Dos Chorreras is amazing. We did not have time to go horseback riding while we were there, but the terrain is beautiful and would have been great on horseback. The chains, we believe, are purely for a rustic effect, as you suggest.